Two years ago, I bought an Elf on the Shelf after Christmas. She never made it out of the box last year because we moved right before Christmas. Every once in a while, I will mention her to Brylee to warm her up to the idea. I think it will be such a fun tradition to start. I plan on posting all of her shenanigans on the daily on Instagram and will hopefully do a weekly updated post here with pictures. Last night I went over the rules of the Elf with Brylee so she would understand that you can’t touch it or he loses his magic. 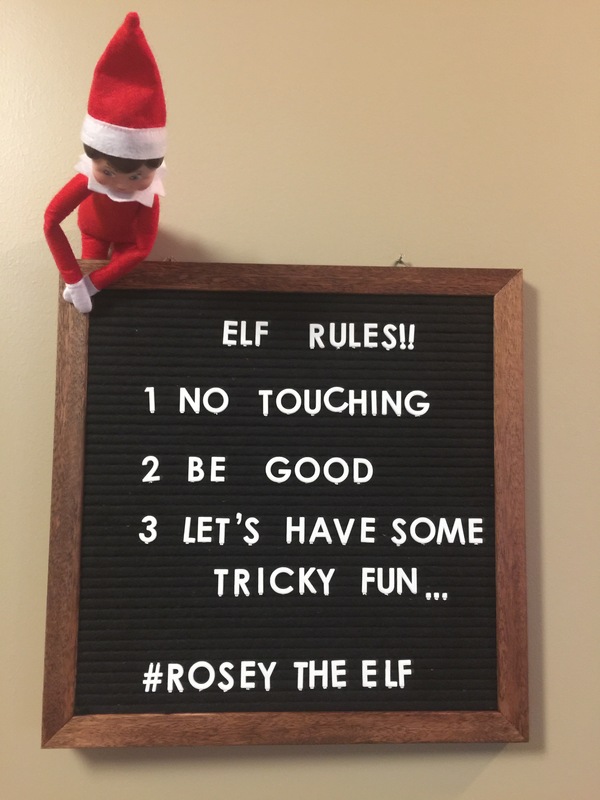 I then asked her what we should name the Elf and after many suggestions like “cowabunga” and “Choo choo train” we finally settled on Rosey. Then Brylee told me Rosey likes to have ‘tricky fun’ and I couldn’t agree more. Anyway here are a few ideas I plan on using, a lot of these correspond to our Advent Calendar so hopefully it won’t be too bad to collaborate it all. These should fall on the respective dates in December and I even tried to match up “National Days” with them. Rosey comes with a note and the elf on the shelf book for Brylee. She will also bring the 25 books of Christmas. Rosey writes Brylee in Christmas lights out of construction paper. Snowball fight out of marshmallows against another toy. Rosey brings stuff for baking cookies (National Cookie Day). Rosey takes a bubble bath (National Bathtub Party Day). Rosey colors Brylee’s nose red and holds the marker. Rosey makes cotton candy in a bowl with a straw. (National Cotton Candy Day). Donut Breakfast Party-I want the Elf to bring donuts for breakfast, but maybe just “Elf Donuts” Cheerios covered in powdered sugar/chocolate. I ended up buying one of these adorable Elf sized mats that she will for sure be using for this (save 10% with this link). (National Pastry Day). Rosey zip-lines on a string with a candy cane. Rosey roasting marshmallows over a tea light candle. Rosey Brings hot chocolate and mugs. (National Cocoa Day). Rosey dresses up as a monkey (using pipe cleaners as a tail) (National Monkey Day). Rosey turns the milk green. Rosey covers snacks in chocolate syrup. (National Chocolate Covered Anything/Ugly Sweater Day). Rosey wrapped in blankets in the fridge. Rosey lifting a Q-tip weight. Decorate a door as a snowman. Fishing in the fish tank/fishing for goldfish crackers. Builds a snowman out of marshmallows. Make Santa Chair out of Lego’s and pretend to be Santa to the toys. Bring Christmas pajamas, Christmas movie, and a treat wrapped up and a note saying Rosey is leaving but Santa is coming that night. Take a bath in the sink. Hang out on the milk carton. Put Brylee’s pretend make up on. Hang out on the tree. Are you doing an Elf on the Shelf? What shenanigans does your’s get up to?